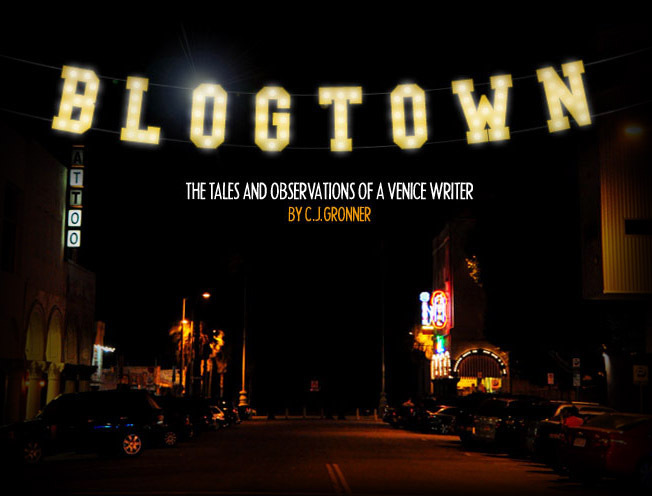 Blogtown: First Mondays At Surfside With Venice Songbird, Suzy Williams! 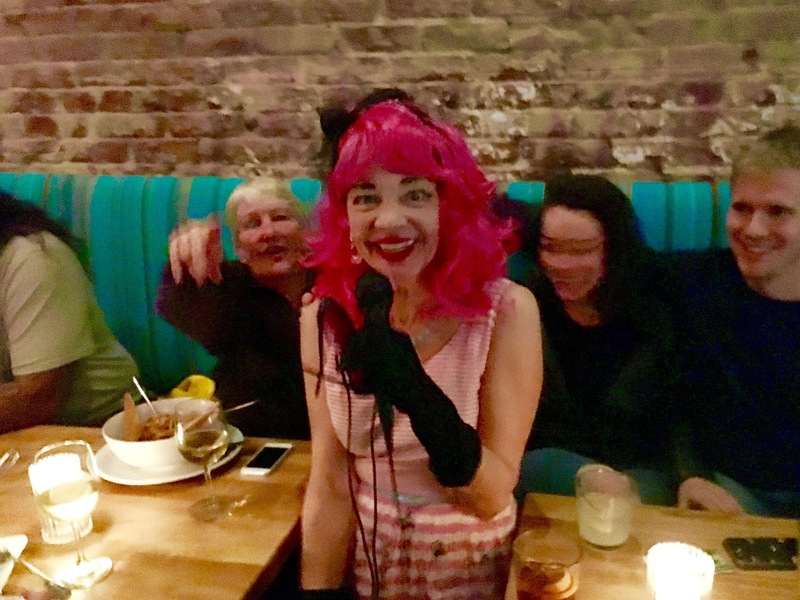 First Mondays At Surfside With Venice Songbird, Suzy Williams! "Well ... at least Suzy is still singing here." I overheard this last night at First Mondays with Suzy Williams at Surfside Venice, when someone was lamenting the loss of Danny's Deli. And MAN, is Suzy ever still singing here! If you've never seen Suzy Williams - The Venice Songbird - strut her stuff, well ... you haven't really been to Venice. She's something else, and takes you back to a cooler, nicer time, when people had fun, and made fun, and WERE fun. It's almost vaudevillian when she belts out her jazzy numbers, usually accompanied by the celebrated Brad Kay on the keys, and you are treated to true musicianship, and real showmanandwomanship. I arrived a little late to Surfside, and Suzy was taking a break to give the floor to the local band, Feisty Heart. They were really good, and I concurred when Suzy said, "Did that sound like Venice, California or what?!" It really did ... like a dreamy seaside soundtrack. When Suzy took back over the microphone, she introduced her next song by saying, "This is a song about trying to get laid." Decked out in a pink wig, pretty dress, and long, black gloves and singing of how "Nature loves a serenade", with Carol Chaiken providing apt trills on her flute ... you surmise it's probably not that hard of a task for Ms. Williams. Because she's awesome. The crowd was very old school Venice, with everyone cheering on Suzy's every note. A young couple from Australia was sitting across from me, and told me that they had to go get cash, because they had to fill Suzy's tip jar ... "She's amazing!" She really is. There's no one else like her around, and she is a bonafide Venice treasure. 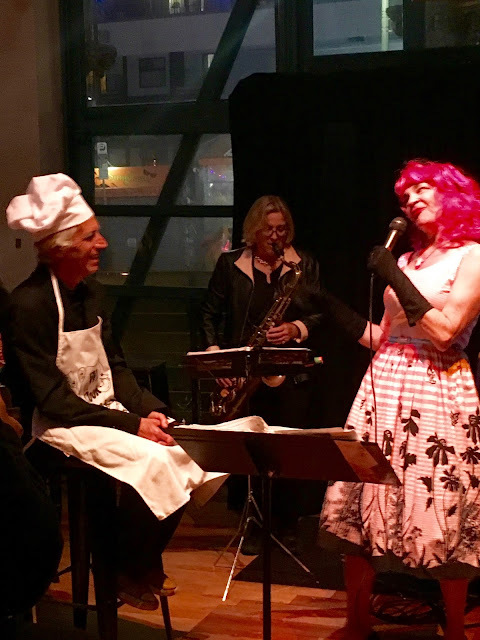 To watch her singing to her husband, Gerry Fialka (clad in a chef outfit for the tune), is to know about Venice living history. Sit down with either of them and you'll learn a WHOLE lot. Her lyrics tend to have great phrases like "The Cat's Meow and the Dog's Bow Wow", those from a Valentine of a song that charmed the room, of course. I ordered up an Old Fashioned, just to be drinking on theme. I loved her tune, "Cover Me", where she pleads with other musicians to cover her songs, so that she may live forever - and she has well over 100 songs for you to choose from, so there you go. "Get Your Own Bad Habits" featured Williams in full Ethel Merman style voice and bawdiness as she got down and dirty in both voice and choreography. I just love her and can't brag enough about being her friend. It's the best. Her next number was dedicated to her friend, Mews Small, who was in the house. Mews played Jack Nicholson's girlfriend in One Flew Over The Cuckoo's Nest, and judging from this song that she wrote, she's got plenty of good stories to tell (She has her own show at the Unurban on February 18th!). "We all have multitudes, and we're all here getting each other - without Facebook!" It was true. Everyone there was very in the moment, and lucky to be in the room together. It doesn't get a lot more Venice than Tonan beaming while listening to Suzy Williams, and looking around to recognize almost every face. What a wonderful Monday thing to do! 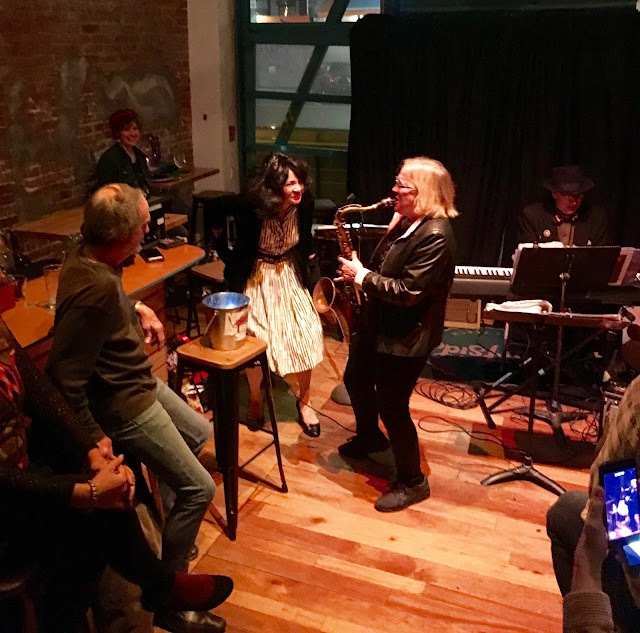 After a brief intermission/costume/wig change, Suzy introduced her stellar band that has Stuart Johnson on drums, Carol Chaiken on just about everything, and the inimitable Brad Kay on those keys, exclaiming, "Let's make America swing again!" Yes. Let's. Between fantastic torch songs, Williams begged everyone to call her if they go to the beach. "If you live in Venice, please call me and make me go to the beach. I don't go enough!" Done. Every day. The time to stop playing came and went, and Suzy said, "If anyone wants to shoo us out, go ahead!" But no one did, and her "penultimate song" about a BBQ drew "We love you, Suzy! 's" To introduce her ultimate song, Suzy spoke on seeing a group of nattily dressed older people she'd seen recently, saying, "Fashion helps you feel not so depressed, so dress up, Kids!" Yes, let's! "I will not go into that good night without a good fight" was the number, and it was extra-great ("My iron lung is gonna make people plotz! "), as was the thunderous applause for all gathered at Surfside on a Monday. And speaking of Surfside ... what wonderful hosts for this gig. Suzy told us, "Surfside actually pays bands money! They support locals, so locals, I think we better come eat here!" Because the food is actually good, and the service is even better. 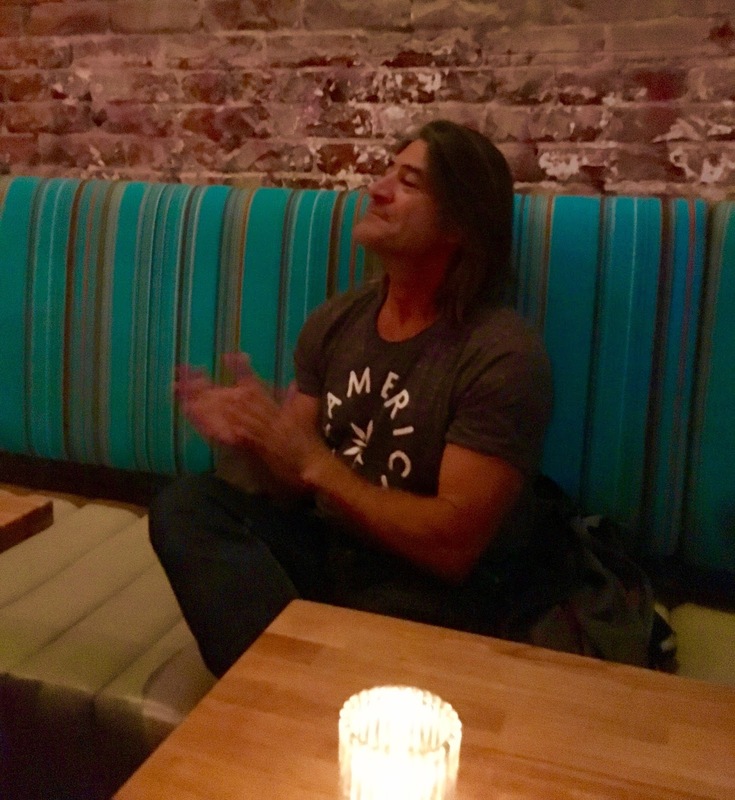 *Special shout-out to Alexis, our server, who was lovely and gracious the entire evening. It's really a great spot for Venice - and we'll be there again on Saturday after the Mardi Gras Parade - Join us! After Suzy shouted her "Thank you's! ", I heard a visitor say to a local, "That was incredible. You live a charmed existence here." He was not wrong. When asked how they came here, the person I eavesdropped on said, "I was seeking asylum." 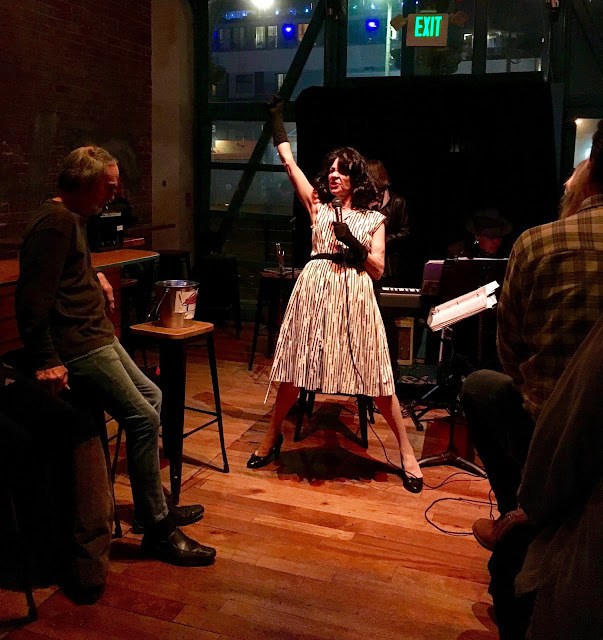 You too can seek asylum from the crazy world at large each First Monday with Suzy Williams at Surfside Venice ... you will simply plotz! Love you, Suzy!